Avalanche Search Marketing Inc. is in the business of helping you market your company’s products or services on-line. We provide search engine optimization, Facebook marketing and Google/Bing/Yahoo paid solutions for clients in all facets of business, from real estate agents and brokers to manufacturers and retailers, sole proprietor firms to multi-national corporations. We have the experience and the staff to handle any size project. New prospects who are actively searching for your product or service are using Google, Bing and Yahoo to look for you. Will they find you? High positioning in the top search engines drives qualified traffic to relevant web sites. Search engine optimization has changed dramatically since 2013. Google, in particular, is actively altering its organic search results to push more firms to its paid Adwords solutions. It’s their game and they get to make the rules. We will tell you where we think we can win this game and, more importantly, we’ll advise you when we think we can’t so you don’t waste your money. 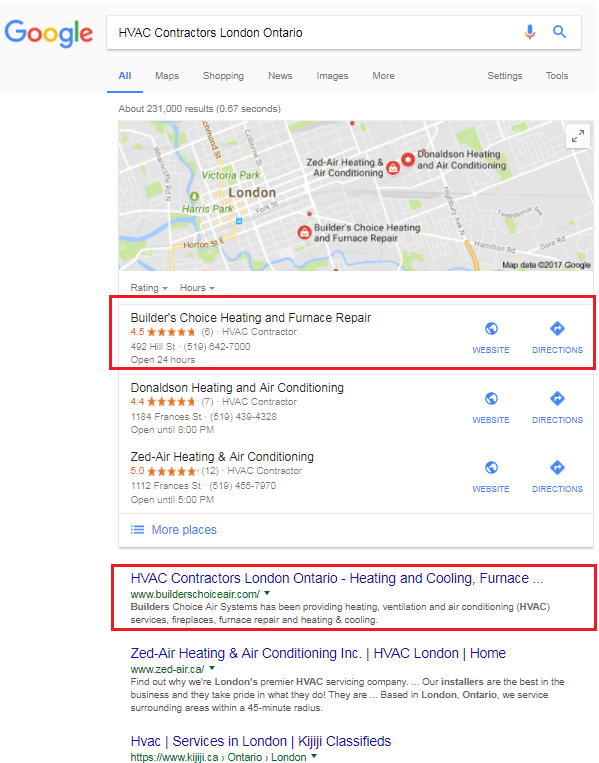 Local SEO — where Google shows a map in the results — has really gained traction in the past couple of years. We know how to get you into those maps! A typical SEO project costs $450 per month — but you only pay half that monthly rate (typically $225 per month) until we’re achieving first page placement in Google or Yahoo/Bing for at least half of the phrases we’re targeting. A lot has changed over the years in the SEO world! There was a time when virtually any link from another website to yours was considered a “vote” for that site. But the value of many of those “votes” eventually waned to the point where Google could actually penalize or ban sites from its results if they were engaged in unnatural linking schemes. This penalization created a problem, of course. On one hand, you needed to build links in order to rank in prior incarnations of Google’s ranking algorithms. On the other hand, Google has changed the rules and now no longer “likes” most of the links that you put in place years ago. To the rescue comes Avalanche’s link removal services. We’ll use several tools to find links coming into your site and we’ll work to remove any that we feel are not generating any significant value for you. And in the cases where the webmaster of the linking site doesn’t respond or refuses to take down the link, there is a way we can tell Google to ignore those links. And if Google’s Webmaster Tools has indicated that manual actions have been taken against links pointing to your site, we’ll work to get those manual actions cleaned up again so that your site is good in Google’s books. Call us at 416-823-6095 to learn more about our link removal services! For many industries, Facebook is the advertiser’s dream! No other medium gives you the ability to target ads at specific demographics and for as low a cost as Facebook. Combine this absurdly low cost per exposure with Avalanche’s ability to write “apps” (programs) to customize your Facebook presence and you’ve got one incredible marketing tool! Call us at 416-823-6095 to learn more about how Facebook ads may be right for your company. In addition to the organic (non-paid) placement, we are well-equipped to manage paid placement campaigns with Google Adwords, Bing Ads and Yahoo Search Marketing. While typically more expensive on a per-click basis than an organic campaign, PPC has the advantage of next-to-instant placement, rather than waiting months for a natural campaign to start bearing fruit. As part of our service, we test multiple ad variations in order to determine which ads achieve the best ‘click-through-rates’ (CTR) for various target phrases. We adjust bids and other settings and implement “remarketing” plans to ensure that we’re getting the best cost-per-click (CPC) and optimize the use of your budget. The ultimate goal of our search engine marketing efforts with PPC campaign management is to get you the greatest number of relevant clicks for your advertising dollar. Are you the do-it-yourself kind of person, but just need a bit of insight into what Google is seeing when it looks at your site relative to your competitors? Benefit from our experience by purchasing a 4-hour block of time ($500 plus HST). You’d be amazed at what we can tell you in a short period of time. And if we know right off the bat that you don’t have a hope of beating Google’s current algorithm, as is the case with most real estate target phrases, we’ll let you know right away at no charge! Call Bruce Lamb at 416-823-6095 to learn more about this option. Do you have a web-based or other computer programming requirement that doesn’t fall into a standard software development definition? We have developed apps for Facebook, and apps for Android and Apple smart phones. We’ve developed programs to read field data into a CAD drawing. We’ve created a program to generate fancy gift certificates with bar-codes that get automatically emailed at a certain date and time. And lots more. We love new challenges so give us a call! Don’t know which on-line marketing option is best for you? Give us a call and we can discuss the pros and cons of each alternative you’re considering. We’ve been doing Internet marketing since 1995 so we know what works and what doesn’t! Which is better: Organic SEO or Pay-Per-Click? The answer to this question depends on how much time you have to see results. “Organic” search engine optimization — where we work to get your website well-placed in the non-paid search results in Google, Bing and Yahoo — can take a very long time to see results, ranging from a month or so to up to a year or more, in the case of very competitive target phrases. But these results don’t cost you anything with each incremental click and tend to have a higher click-through rate than paid ads. As a bonus, you tend to get found for a lot more than just the specific phrases we’re targeting. With Pay-Per-Click (PPC) advertising, such as Google Adwords, you can be getting clicks very quickly, often within hours of giving us the go-ahead. But clicks with PPC ads tend to become more expensive over time. A down-side to PPC is that clicks for which you are paying may not actually be from qualified prospects, such as when competitors click on your ads in order to cost you money (known in the trade as “click fraud”). What do Pay-Per-Click ads cost? The cost per click depends on the volume of people using the target search phrase, the number of competitors bidding for that target phrases, and the quality of the ad and target landing page. 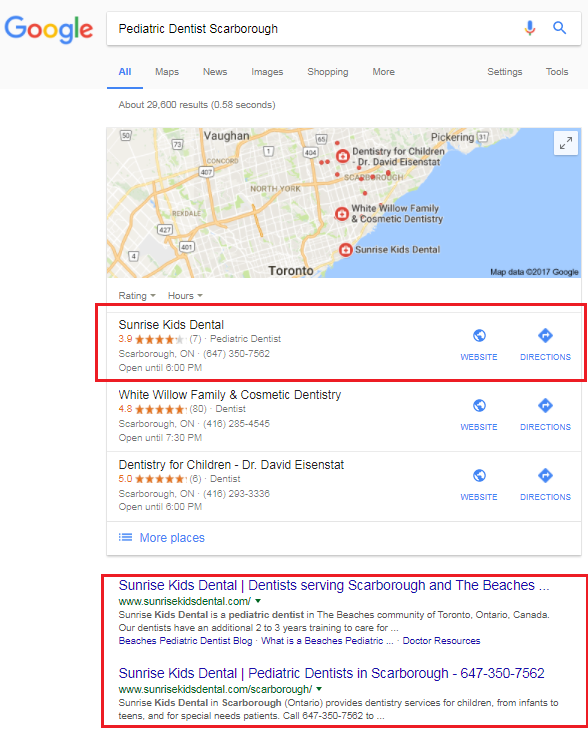 Dentists, for example, can easily pay $10 per click because there isn’t a huge volume of people searching for a dentist at any one time, yet there are lots of dentists out there bidding up the rate. Real estate agents are typically in the $2 to $3 per click range depending on the market; there tends to be many people searching for homes for sale at any one time, although there is also a lot of competition for placement. And lawyers pay a huge amount per click — mostly because they can afford to bid and pay high amounts since the value of a single new client makes the high bids worthwhile. Ultimately, though, while we can give a pretty good guess on the cost of a click, we won’t know for sure until we actually implement a new project how much the average cost per click will be. Our goal is to get you the greatest number of relevant clicks within your budget. Why would I do Facebook ads instead of Google ads? Google ads and organic SEO have the advantage that they show your website to a person while they are actively searching for what you are selling. But for lots of businesses, the marketing objective is to generate awareness or brand recognition. Facebook ads can be an incredibly cost-effective way to introduce your company to the perfect demographic audience. For example, if you were a wedding planner, you could show ads to females between 22 and 32 years old who live in Toronto and who are engaged to be married (14,800 people on Facebook in this demographic). A fancy restaurant in London Ontario could target Facebook ads to people living within 40 kilometres of the city who are employed in business and financial operations (4,600 people). If you have an identifiable demographic audience, there is usually a way on Facebook to show your ads to those people, often for a fraction of a penny per impression. Can't I just do it all myself? The short answer to this question is, ‘Yes, you can try to do it yourself’. But it isn’t as easy as it might look on the surface. It is almost impossible for non-professionals to be successful with an organic SEO program unless they are incredibly lucky or in a very uncompetitive market. And while pay-per-click options are available to anyone, the user-interfaces are getting more and more complicated, and the features such as ‘remarketing’ are more complex to implement. Combine the complicated interface with the fact that the campaigns need to be monitored continually to stave off ‘bid creep’ (where your average bid creeps up over time) among other wasteful occurrences, and for many people it is just far more cost-effective to leave it to the professionals, like our team at Avalanche. Your time and energy is better spent doing what you do best. If you talk to 100 different SEO firms about “what it costs”, you’ll likely get 100 different prices. Everyone has a different strategy to achieve placement. Some firms charge what we feel are exorbitant rates. Others charge reasonable or low rates but do virtually nothing. So how do you make a decision? A typical project has us working on 6 target phrases, and for that we charge $450/mo. But until we are achieving first-page placement in either Google or Yahoo/Bing for at least half of those phrases, we only charge half the monthly rate (typically $225/mo.). This gives us lots of incentive to get you ranked quickly, and also means that you’re not dishing out a ton of cash without having web leads coming in to pay for it. As a bonus, you will get excellent placement for lots of variations — possibly hundreds of variations — of the 6 phrases we’re targeting for you. We have tons of references (mostly in Ontario but some in other provinces and the U.S. as well) who can verify that we know what we’re doing! With over 100 active projects, we have lots more examples of excellent placement in Google, Bing and Yahoo that we’ve achieved for our clients! Your web site is like a store front on the Internet. Imagine now a great looking, well stocked store which no one but you and your closest friends and colleagues know about. Your site needs to be found or it is not going to get traffic, just like a high-end boutique situated in an under-travelled part of town. Search Engine Optimization puts your website front and centre to searchers looking for your product or service. Our process can get your website from search pages with little traffic to right up to page one. We will bring the potential customers to your site. Avalanche Search Marketing’s 100% Canadian team specializes in marketing your web site, and by extension, your products or services, through a combination of search engine optimization (SEO), paid advertising programs, and web programming / app development. Call us at 519-964-3738 ext 2 (London), 416-823-6095 (Toronto), or toll-free at 1-888-994-2223 any time, and chat with one of our reps today.